For the second time in the last three months, Great Britain’s top promoters Eddie Hearn and Frank Warren went head-to-head with dueling fight cards in England. When this last happened, back on Dec. 22, Warren had the stronger card from top to bottom, but Hearn’s show had the more compelling main event, namely the rematch between Dillian Whyte and Dereck Chisora. Today the roles were somewhat reversed. Hearn’s show had the stronger undercard, but the fighter attracting the most eyeballs, undefeated heavyweight Nathan Gorman, is promoted by Warren. In a predictably desultory affair, Nathan Gorman (16-0, 11 KOs) outpointed Kevin Johnson (34-13-1). This being a 10-rounder, the referee was the sole arbiter and he gave every round to Gorman, a distant cousin of Tyson Fury. Kevin Johnson, a pro since 2003, took Vitali Klitschko the distance in 2009 and Tyson Fury the distance in 2012 and more recently went the full route with Daniel Dubois and Filip Hrogivic, but he won scarcely a round in those fights and in recent years has degenerated from a journeyman into a trial horse. He came into the fight 20 pounds heavier than in his last start 13 weeks ago and fought to survive, allowing Gorman to initiate what action there was. Frank Warren can’t be blamed for promoting this snoozer. Johnson was a late replacement for Fabio Maldonado, a Brazilian who, although something of a mystery, was expected to provide Gorman with a sterner test. But Maldonado reneged after getting a better offer and will now fight Oleksandr Teslenko in Toronto next week. The 22-year-old Gorman, who carried 253 pounds on his six-foot-three frame, is very light on his feet and some expect him to out-box his harder punching countryman Daniel Dubois when they eventually meet. In the featured bout, Sam Bowen, a Leicestershire man, retained his British 130-pound title with a ninth round stoppage of Scotland’s Jordan McCorry. Bowen improved to 15-0 with his 10th stoppage. 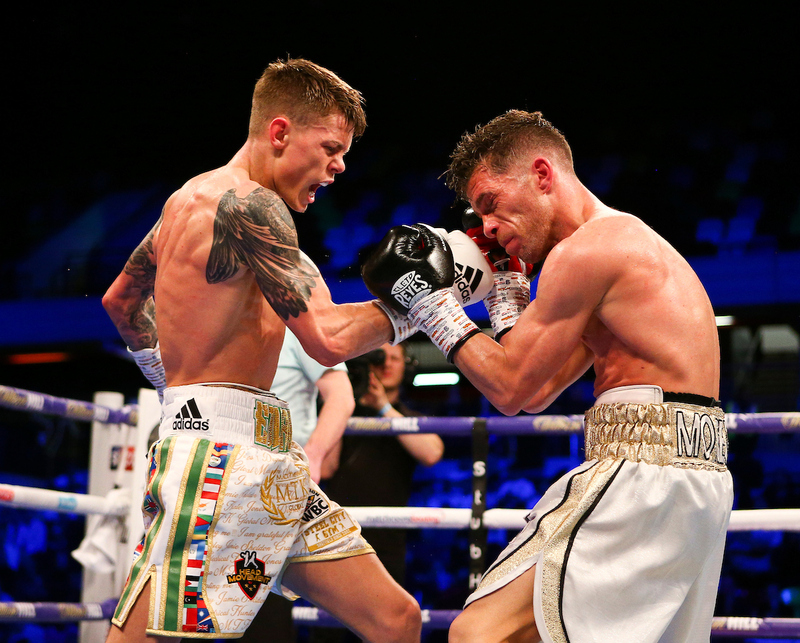 In the main event of Hearn’s card, baby-faced Charlie Edwards (pictured on the left) put on a clinic in the first defense of the WBC world flyweight title he won with an upset of Cristofer Rosales. Edwards (15-1, 6 KOs) won every round over determined but outclassed Angel Moreno (19-3-2), a 35-year-old Spaniard and former sparring partner. Edwards scored a flash knockdown with a counter right hand in round six. All three judges had it 120-107. Irish middleweight Jason Quigley, who signed with Golden Boy coming out of the amateur ranks and had fought exclusively in the United States, improved to 16-0 (12) with a second round stoppage of Mathias Eklund (10-2-2). Eklund was on his feet, but the ref thought it wise to keep the overmatched Finn from taking more punishment after Quigley blistered him with a series of unanswered punches. Quigley’s dream fight would be a match in Ireland with stablemate Canelo Alvarez. Joshua Buatsi, an emerging star in the light heavyweight division, chopped down Liam Conroy to win the vacant BBBofC 175-pound title. Buatsi had taken out his last three opponents in the opening round but Conroy, who came into the match riding a nine-fight winning streak, lasted into the third. Buatsi, a Londoner born in Ghana and a bronze medalist at the Rio Olympics, improved to 10-0 (8). Conroy, who was on the deck twice, fell to 16-4-1. Conroy’s promoter Eddie Hearn confirms that Buatsi’s next fight is likely to take place at Madison Square Garden on June 1 underneath Joshua-Miller. In a cruiserweight fight with British and Commonwealth titles at stake, Lawrence Okolie improved to 12-0 (9) with a fourth round stoppage of Wadi Camacho (21-8). Okolie knocked Camacho to his knees with a hard combination and finished him off with a big right hand. The most inexperienced British boxer to ever compete in the Olympics, the rangy six-foot-five Okolie has sparred with Anthony Joshua and Tyson Fury and will almost assuredly compete as a heavyweight when he grows into his body.